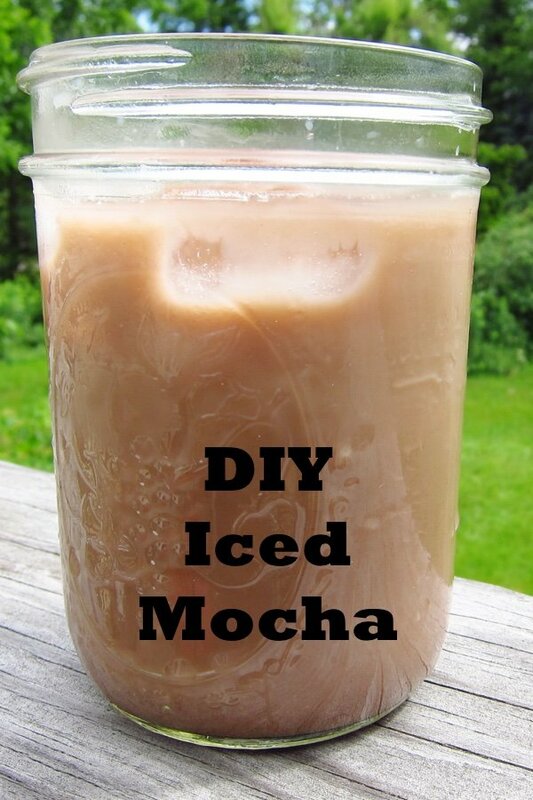 It is super easy to make an iced mocha at home. In fact, this iced mocha recipe couldn’t be easier. Whew! I don’t know what temperature it is in your neck of the woods, but here it is hot. I love hot weather because it makes me instantly lazy – not unlike a sloth. I find myself slowing down despite my internal need to pick up those SOCKS. Do you know what I mean? Sometimes, I make a coffee smoothie but I don’t like to have to clean my blender when it is hot out. I paid $4 for a Iced Cafe Mocha at Starbucks because I couldn't resist (290 calories). The key to that purchase was that I didn’t have to wash their blender. 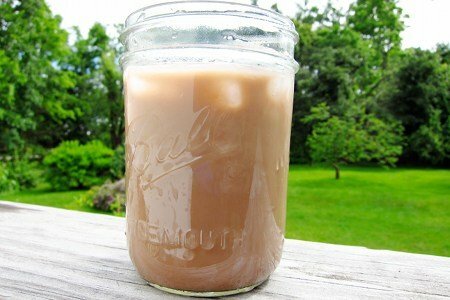 I made 4 Mason jars of mocha in the video and I drank them all while I was writing this post. Sleep may be optional tonight. Do you love coffee in the summer? How do you drink it? I brew a cup of coffee, add some half & half and then a scoop of chocolate protein powder (I use Unjury because it's high quality and tastes good enough to make chocolate milk with). This is my breakfast every day, and then in the afternoon, I repeat, except I pour over ice! High protein, low sugar mocha! Recently I've discovered Premiere Protein liquid...I've NEVER liked one of these liquid supplements before now...this one is great...mix with a bit of ice and a squirt or two of the concentrate coffee flavor (I've been using Mocha or Caramel Macchiato)...easy and delicious. 30 grams of protein helps me past the cravings and allows me to have something 'chocolate' without all the sugar. Only 1 gm sugar per serving. With or without the blender it's faboo! I also make mocha ice cubes so my drink doesn't get watered down as it melts. I just take some of my and freeze it to have on hand. I drink iced coffee every day! I pour hot decaf over a large cup of ice (20 oz. 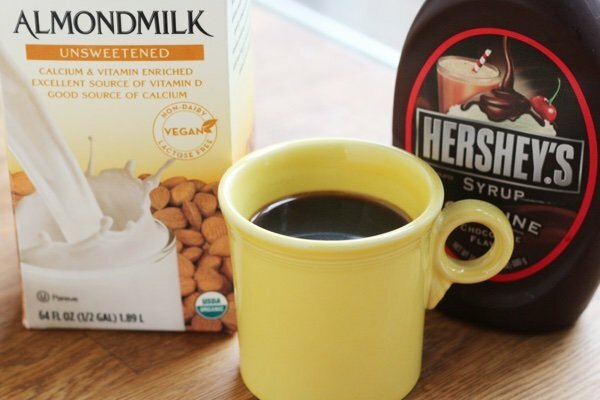 )I add a tablespoon of sugar free flavored coffee creamer and it is only 15 calories! How do you make that coffee shake you mentioned? DaVinci makes sugar free syrups of all kinds and have recipes on their site.They will ship their products and ours have arrived in just a few days. We make our mocha lattes from sugar free caramel syrup, coffee and real 1/2 and 1/2 or cream. We have full fat products every day and have lost weight. LOVE the word "veranda"!!! Makes a porch soon much more elegant! Great idea but Hershey's chocolate syrup is nothing but high fructose corn syrup. DaVinci makes one with cane sugar. Best make your own syrup or try to mix cocoa powder into the hot coffee first. I love the "grab and go" aspect of this recipe. And the almond milk tip. Thanks, Lisa. It's hot at my house, too!!!! I drink protein shakes for breakfast a lot since my lap band surgery. I use k-cups for the coffee and add syrup along with the protein powder. What really makes this drink great is Skinny Mix Mocha. It is very low calories and use it also in brownies to give them a really rich taste (Ina is right!). Jordan's Skinny Mix has other flavors such as Mango, Tiramisu and flavors to make low-calorie alcoholic drinks. The mango is great in iced tea. They can be mailed ordered (they are made locally in Clearwater, FL, but I buy them mostly in Tuesday Morning stores. Ross and others have them as well. Thanks for the recipe; will try making your recipe as I have all the ingredients!!!! Thanks for your website. It is a "jewel!" Use Walden Farms caramel or chocolate syrup. (ZERO calories)!!!!!!!!!!!!! I make a recipe similar to this every single day. We have a Starbucks for us I'm out, and I brew 8 ounces of Sumatra coffee. I warm 8 ounce of skim Fairlife milk. If you are familiar with Fair life, and you drink cows milk, I suggest heavily you check it out! I have he and some Splenda to taste, and one packet of Swiss Miss Lite and blend with an immersion blender. This is amazing and full of protein! As you can see, I have no plans about artificial sweetener. But the protein kick in this keeps me going hard and I will often have another one midmorning as a protein shake. I'm in Massachusetts also! I drink iced coffee year round. I use Torani sugar free syrup as flavoring. I use Splenda, too, and sugar free powdered creamer. I freeze coffee in ice cube trays so my drink isn't diluted. I use half almond milk and 1/2 coconut cream (Aroy-D is my fav). Nestles syrup doesn't have HFCS but I usually use cocoa powder and carob powder. If you use a blender, pitted dates make a great sweetener. I use about three. As a PS, I now use Intelligent Blends K-Cups for a cup of coffee and iced decaf drinks. (always decaf). They're Salted Caramel blend is incredible. They don't charge shipping, tastes like reg caffeine coffee & I can brew as much as I like on a 'limited budget (35-39 cents a cup)!' I still use the Mocha skinny mix, but the salted caramel (as well as their other blends) are strong enough to not need additional flavors! By the way, Love your website!!!!! (Coffee Dry Milk Powder Dextrose Sucralose).